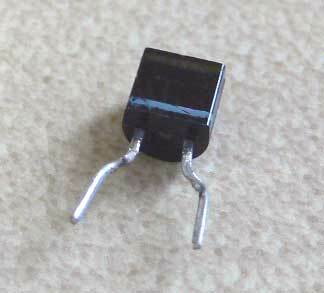 This is the Varcap diode (looks like a transistor with a leg missing! T1 which is square shiny metal box with a screwdriver adjustable slug at one end and 5 pins at the other., this is a 10.7MHz IF transformer (we are not using as that though! 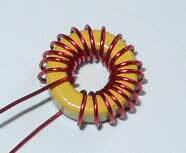 and finally the dreaded toroid, this is the VFO coil so its important to get this right but its not hard. Read the instructions that came with the kit page 3, that tells you all you really need to know but here is some more help. Its only yellow on one side! Now we need to consider what part of the band (80m) we want our radio to work, i want mine (i guess you will too) to work with a top freq of around 3.565MHz to get there we need to wind 20 turns of wire on this core, not 19 or 21 it needs to be 20 , is that clear. There are 7 turns on this core can you count them? 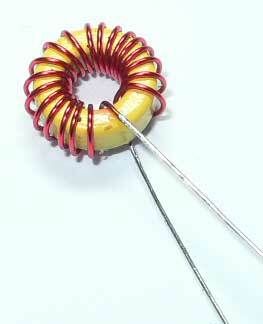 Ok lets get this VFO coil wound, read the instructions again that come with the kit (page 3) to make sure you understand how to 'Sow' this coil, its easy! I think you can just about count the turns and see that we do have 20, space your turns like the ones in this picture after you have finished and trim the two leads to about 1 inch or so. The only point of note here is that R17 is shown the wrong way round on the silk screen, if you look at the instruction manual it shows this on Page 12 Group 4 drawing, you can also see it on the picture below. Next fit the capacitors but not C7 we will come to that at the end of this section. 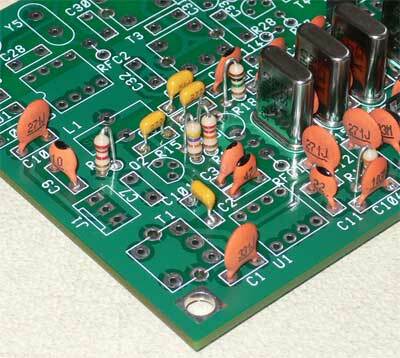 Here all the resistors and capacitor (except C7) are fitted , note R17 position. 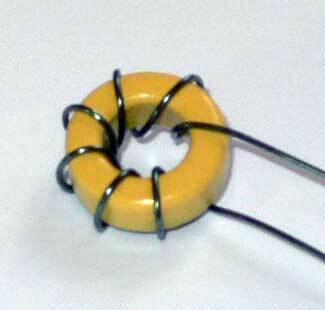 Now fit that metal can Inductor T1 next, bend over the two metal lugs from the can and solder them too. is up to you, after all you are doing this to learn too. Check that you have a good connection on both sides of the coil by using you meter on the back of the board on the ohms range, the coil should read as a short circuit, once you are happy that you have a good connection here than trim the coils leads. Well Done you have finished the RX side of the rig, that wasn't to bad was it? don't do this if you are new to building or have some degree of self control! Ok Ok if you really want to you can connect up the board at this stage and get it working on Rx, im not going to offer any help with that, if you know what your doing its not hard just two pots and a few wires, I must admit to having done that with mine and im listening to it now as I type this, I needed to fit a 22pf cap for the range I want at C7 but if your not going to play with your radio yet we will come to that later so just move onto the next stage, out of interest the RX seems fine, plenty of signals that can be copied well, just a quick tune of T1 bought it to life my freq coverage is 3.525-3.566Mhz which is about 41Khz , for me that's just the part of the band I like, current drain was just under 16mA @ 11v (must recharge that SLA Now) I had it tuned on for a few min's while I was checking the freq coverage and current etc and when I tuned in a nice steady signal it seem to have no real drift from the vfo (a quick check showed about 20hz in 10 min's and it hasnt had chance to warm up yet!) 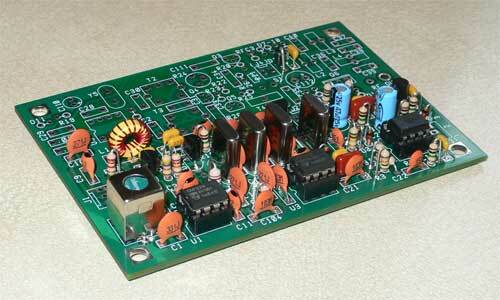 ,Thats not bad at all for a LC VFO , my Elecraft K1 is not that good! when its finished I will measure it and report back.